The STAGO continues its over 30-year long standing summer recital series. 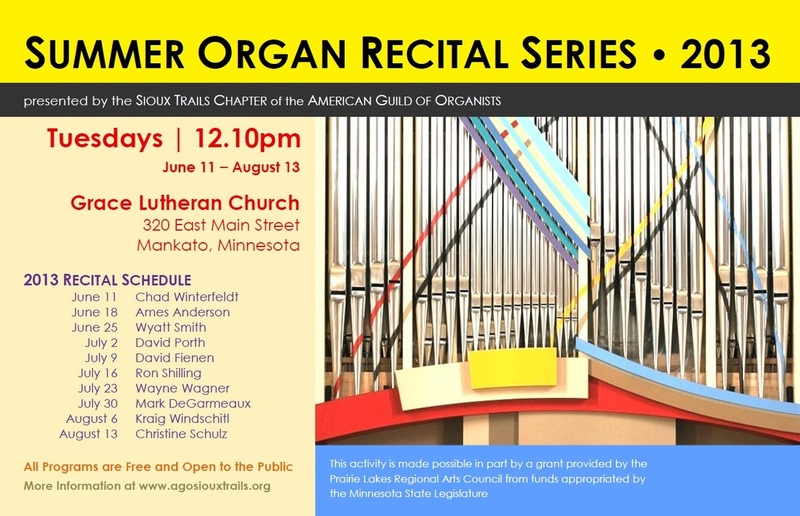 This year the half-hour recitals will be held at Grace Lutheran Church (320 East Main Street) in downtown Mankato, featuring the Elias J. Halling Memorial Organ built by Hendrickson in 1992. Recitals will take place every Tuesday at 12.10pm, and running from June 11 through August 13. All programs are presented free of charge and are open to the public. Featured will be a variety of performers from the area. Grace Lutheran Church offers ample parking, accessible entrances, and air-conditioning. A free-will donation will be collected to defray costs.